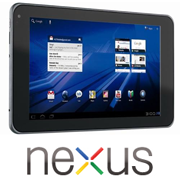 Google’s long-awaited Nexus tablet has popped up on benchmarking site Rightware. According to the specs, the tablet, dubbed the Nexus 7, will use a quad-core NVidia Tegra 3 processor, and come with the Android 4.1 (“Jelly Bean”) operating system. Google CEO Eric Schmidt promised a Google tablet would be coming within six months last December. If Google is to meet that six-month timeframe, Google likely will officially introduce its first Android tablet in June. Rightware’s PowerBoard benchmarking tool gives us some hints on what to expect. First, there’s the name: “Google Asus Nexus 7,” suggesting this will be a 7-inch tablet manufactured by Asus. Details on the device show the display to have a 1280-pixel-by-768-pixel resolution. Inside, the slate tablet sports a quad-core NVidia Tegra 3 processor (which actually has a hidden fifth core) clocked at 1.3GHz along with an NVidia ULP GeForce graphics processing unit. As for software, the Nexus 7 shown on the PowerBoard site is running Google’s latest Android tablet OS, Android 4.1 JRN51B or “Jelly Bean,” as Android Police discovered with a little digging. Five Nexus devices, including both smartphones and tablets, are expected this fall, but look out for the flagship Google Nexus tablet any day now.